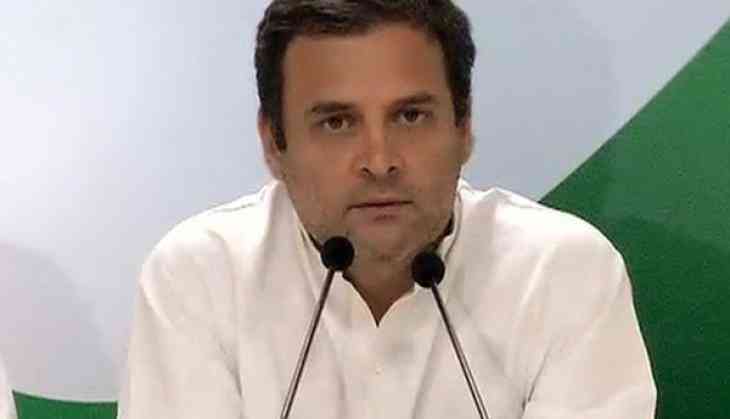 Congress president Rahul Gandhi Friday accused Prime Minister Narendra Modi of bringing ignominy to all chowkidars (watchmen) in the country. Addressing campaign rallies for the November 28 Assembly polls in Madhya Pradesh, Gandhi said the situation now is such that whenever the word chowkidar is uttered, people say "chor hai" (is a thief). "Wherever you go, as you pronounce the word "chowkidar" comes a reply "chor hai". I want to apologise to the chowkidars of the country. It is not your mistake, you all are not thieves, you all are honest. Only one person has brought ignominy to you. The country's prime minister has defamed all its chowkidars," he said. Before coming to power in 2014, Modi used to talk about combating corruption, unemployment and farmers' welfare but is now mum on these issues, Gandhi said. The sentiment across the country is that he broke their trust, Gandhi added. When Modi gave the "acche din" (good days) slogan ahead of the 2014 Lok Sabha polls, people would respond to the catch-phrase, saying "aayenge" (will come), he said. The promised "Acche Din" were not meant for the people but for some top industrialists, Gandhi said. Good days have come for industrialists like Nirav Modi, Anil Ambani and Vijay Mallya, he added. Modi, in his election campaign in 2014, had said he wanted to be the country's chowkidar, not the prime minister. "People had then reposed faith in him. The youth were assured two crore jobs, farmers were assured minimum support price for their produce, the entire India was assured that Rs 15 lakh would be deposited in the bank account of each citizen. People believed this then," Gandhi said. "Why has this changed? In four years, people found that these (promises) were false. Narendra Modi speaks lies. This is the sentiment in the country, because he has broken the (people's) trust," Gandhi said. A "Congress wave" would sweep Madhya Pradesh, Rajasthan, Chhattisgarh, Mizoram and Telangana, he said. The BJP-led government waived of Rs 3.5 lakh crore loans of the rich, but did not write off debts of farmers, he said. The previous Congress-led UPA government, on the recommendation of the Indian Air Force, decided to purchase 126 Rafale fighters at a cost of Rs 526 crore per plane with the stipulation that the state-owned aerospace company Hindustan Aeronautics Limited (HAL) would make them in India, Gandhi said. "But Modi went to France and conveyed to the French government that each Rafale jet will be purchased for Rs 1600 crore. He told them to give the contract to (Anil) Ambani instead of giving it to HAL," Gandhi said. There was no immediate reaction from the BJP on the allegations. The ruling party has dismissed the charges in the past. The Congress president asked his party men to stand at polling booths and not back off "even an inch" to convey a message to the BJP that people of Madhya Pradesh are now with the principal opposition party. Gandhi, who faces a defamation suit for claiming that Chief Minister Shivraj Singh Chouhan's son was named in the 'Panama Papers', said, "I spoke mistakenly that Shivraj ji's son was named in Panama Papers, actually it was Chhattisgarh CM's son. Shivraj ji threatened me of filing defamation suit." "But when I talk about scams like e-tendering, Vyapam, illegal mining and mid-day meal scam, he (Shivraj) doesn't speak a word, he doesn't threaten to file defamation. What does it mean," he said. Chouhan "stole" people's money in Vyapam, the entrance examination, admission and recruitment scam unearthed in Madhya Pradesh in 2013, he said.